Okonomiyaki is getting slowly more popular outside of Japan. 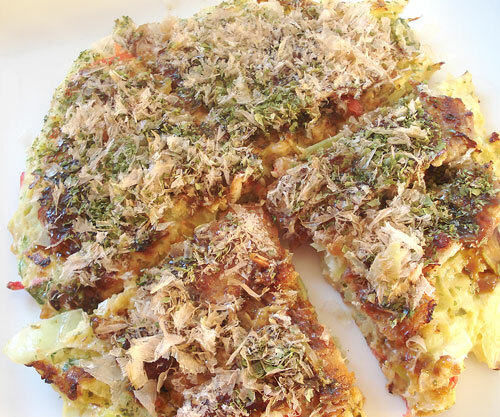 It's often described as a Japanese pizza, but it's more like a savory pancake. Okonomiyaki was invented, they say, in Osaka, which is a city famous for cheap and good eats. Okonomiyaki is a snack more than a full meal, though it is pretty filling. It's a quintessential yatai or streetside food stand food, though nowadays you're more likely to eat it indoors than sitting at an outside stall. It's a very communal type of food, especially if you cook it on a tabletop griddle. This is a fairly authentic recipe I think, or as authentic as a Tokyo born-and-bred girl can get. A lot of people have a mild allergic reaction to raw grated nagaimo. I have that reaction - it makes me itch a bit. So I avoid skin contact with the raw surface by only peeling as much of the root as I need (for this recipe, about 4 inches or 10 cm) and holding the root in its plastic wrap while grating. 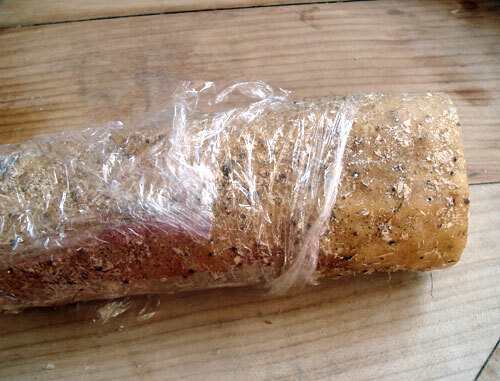 To keep the rest of the root, let the exposed cut end dry off a bit then wrap securely in plastic. The glutinous, gelationous quality of the nagaimo gives the okonomiyaki batter a certain bounce. I've tried substituting grated potato, which sort of works, but nagaimo is better. The only subsitutes for nagaimo are even harder to get outside of Japan, yamaimo or yamatoimo. I can get raw nagaimo in my tiny local Japanese grocery, so any decent Japanese grocery store should have it. This is a dried, very green version of nori seaweed. It's usually sold in finely shredded almost-powder form. It's quite inexpensive, so it's worth buying. A substitute would be finely shredded regular nori, but aonori is usually a bit cheaper. Used as a topping. Dried bonito flakes. One of the essential Japanese ingredients. Used as a topping with aonori. This is a sweet version of tonkatsu sauce, which is described here. This is available at Japanese grocery stores. You can use tonkatsu sauce instead. It's not essential to use this sauce - my mother for instance prefers a little drizzle of soy sauce on her okonomiyaki instead. Mayonnaise is used as the sauce on top of the okonomiyaki by a lot of people, though it does make the whole thing very rich. A Japanese brand like Kewpie is preferred, though Hellman's or whatever works too. It adds richness and a touch of acidity. The base of Japanese food! Here is the basic recipe, but you can use a pinch of dashi stock granules (such as hondashi). Pickled and red dyed ginger. Colorful, cheap, and cheerful. Available at any Japanese grocery store. 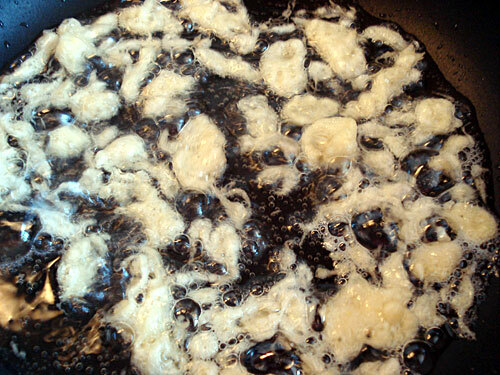 Tenkasu is little bits of batter that fall into the oil when you are frying tempura. It's used as a flavoring ingredient in a surprising number of dishes. You can actually buy premade tenkasu in a well stocked Japanese grocery store, but I find it hard to justifying spending money for something which is just oily bits of batter. On the other hand, I don't really make tempura often enough to have a stock of tenkasu around. So what I do is to make some of the okonomiyaki batter into impromptu tenkasu. I'll show you how in the instructions. Tiny dried shimp. This is an optional but nice ingredient to put in. This is the part of pork that gets turned into bacon. In Japan you can get this part very thinly sliced, as a normal supermarket cut (butabaraniku usugiri). Elsewhere, you may have to ask your butcher to slice it for you. If you can't get it pre-sliced, get a chunk of pork belly, freeze it until it's quite stiff but not a solid ice block, and slice it yourself. You should have these around. Regular flour is fine - you only need a little bit of it as a binder. Professional okonomiyaki stores may use beautifully finely shredded cabbage, but if your knife skills do not measure up, roughly chopping it (even in a food processor) is fine. So, if you've managed to get all the ingredients together, let's make okonomiyaki. This makes 3 medium or 2 big okonomiyaki. A medium okonomiyaki would feed one person. A big appetite can handle one big okonomiyaki. You can also cut them into slices to serve many as appetizers or beer snacks. Increase the amounts proportionately for more servings. Peel and grate the nagaimo, following the hints above for protecting your hands. 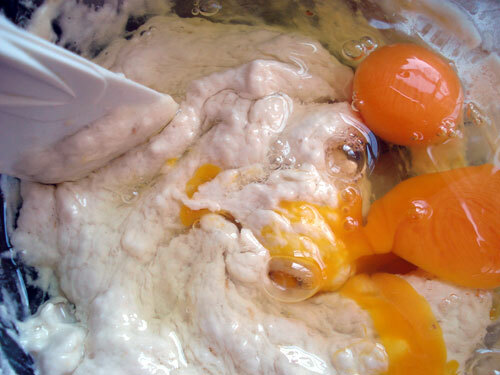 Mix with the dashi and flour, and add two of the eggs. It should be a rather loose batter. At this point, if you don't have any tenkasu on hand, heat up some oil in a small frying pan. Dribble some of the batter in the hot oil. Cook until golden brown. Drain off the oil (you can use it to cook the okonomiyaki) and allow the tenkasu to cool. 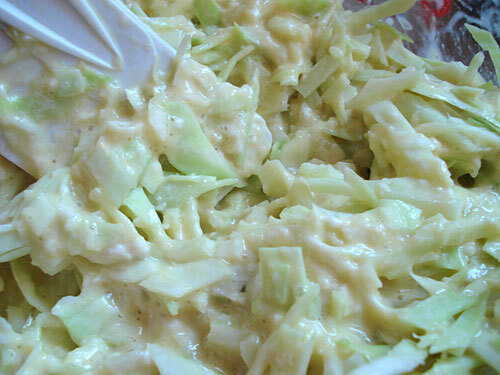 Add the chopped cabbage to the batter. Add the other egg. Stir with a big spoon or a spatula to combine. Add the other ingredients except the pork. Crumble the tenkasu with your hands a bit before adding. Stir to combine. Heat up your griddle pan or big frying pan. 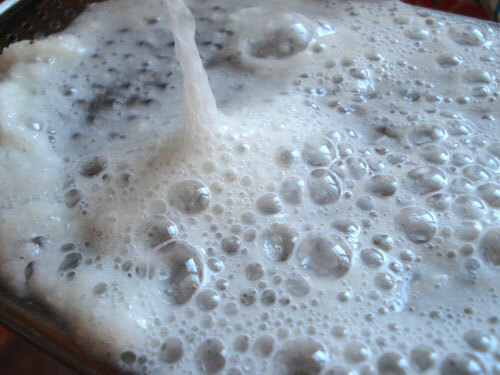 Take a wad of cotton wool or paper towels, and spread around a thin layer of oil. The heat should be about medium-low. Spread 1/3 to 1/2rd of the batter in a circle on the pan. If this is your first time, go with the smaller size to make flipping easier. 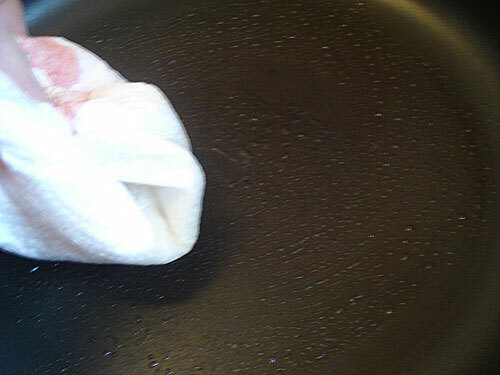 Place 2 to 3 strips of pork as flat as possible on top of the batter. Put on a lid, and let it steam-cook for about 5-6 minutes. 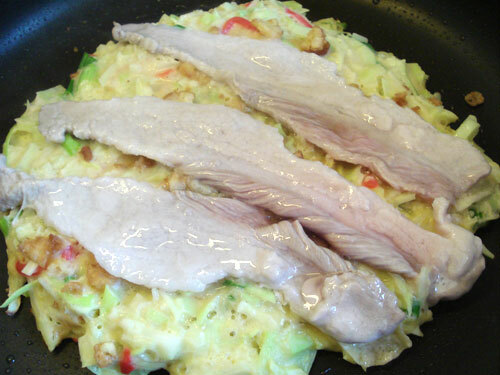 When the pork has lightened up in color, it's time to flip the okonomiyaki. Take two spatulas and flip the thing over carefully. Voila! 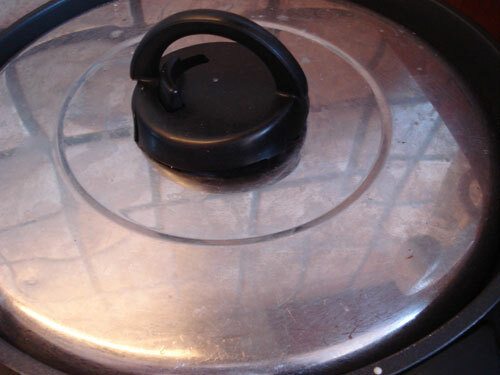 Continue cooking without a lid for about 3-4 more minutes. Lower the heat if it's cooking too fast, or turn it up a bit if it isn't. Try to resist the urge to press down on the okonomiyaki at this point - doing so will squeeze some air and fluffiness out of the okonomiyaki. Flip over once more, so the pork side is facing up. Brush with the sauce of your choice - straight okonomiyaki sauce, a mix of okonomiyaki sauce and mayonnaise, soy sauce, etc. Sprinkle on some katsuobushi and aonori liberally. To serve, cut into 4 pieces (the pro does this on the plate with a spatula, but you can use a knife on a cutting board). A Hiroshima-style okonomiyaki is either two of these with some yakisoba (pan-fried noodles) in between, or one of these as a base, topped with a mound of yakisoba, and then a fried egg. One Hiroshima-style okonomiyaki comes in at around 1000 calories. Enjoy. You can omit the pork belly slices. You can try substituting bacon, but that would flavor the whole thing. You can get okonomiyaki mix, which has flour, nagaimo powder, dashi, and things already in there. You just add water, or water and egg, depending on the kind. But, that's not nearly as much fun. Submitted by maki on 2008-02-08 20:50. My eyes popped when I saw this recipe!!! It looks... filling. I bet it would make a good bar snack or hangover food, but to these American eyes it reminds me most of an appetizer you can get at the Unos Pizza chain... the one with mashed potatoes in a deep dish pizza crust with cheese and bacon and onion topping. I think it was ranked one of the worst foods in the world in terms of fat content and lack of nutritional value, but oh boy is it ever tasty. It is very filling...but not that bad nutritionally. It has very little oil in it, only 2 or 3 thin slices of bacon-like meat, and at least a whole cup or so of choppped cabbage. I think it's probably around 250 calories for a whole one, or 300 if you load up on mayo in the sauce. An Osaka style okonomiyaki is around 1000 per serving. Not necessarily because it's unhealthy but because there are a lot of ingredients in it. Great, super informative okonomiyaki post! It has been a while I last made okonomiyaki. Wow. I didn't realize how intricate the recipe was. All the ingredients are readily available here in Honolulu but I have only had it freshly prepard at food counters from Japanese department stores here (Shirokiya, Daiei). I have also come across a couple of Japanese restaurants that specialize in this dish. I am not familiar with nagaimo but had yamaimo growing up. My grandfather used to grate it up and put into miso soup and enjoyed it that way, I call it tororo. I however, had difficulty eating it like that as it was really slimy. Lol. Funny thing, I just looked up 'tororo' on wikipedia and it says that it was used during the Edo period as a homosexual lubricant. I can see why, but not sure why it wasn't used as a heterosexual lubricant. as other ppl previously said: wow. i'm not sure if i can get all the ingredients here in manila, but i know this stall in a mall downtown that makes decent okonomiyaki. makes me want to go there really soon and get me a fix. If you guys want to try out okonomiyaki made by an actual Japanese community in Manila, you can check out Kagura which is in Little Tokyo (yes it's the Japanese counterpart of Binondo or Chinatown in Manila) along Chino Roces Ave. formerly Pasong Tamo. They have a bunch of other restaurants and groceries there too. [quote=kantogirl]as other ppl previously said: wow. Wow! I'm visiting Osaka in a few weeks! I will be sure to seek this out!!! I'm a huge okonomiyaki fan, and have always wondered if there was some relationship between okonomiyaki and Korean kimchijeon/pajeon? Did one inspire the other? I rather doubt that either one directly influenced the other - they are both after all, just pancakes. Almost every country/culture that has some sort of flour has a pancake-type recipe. Both are delicious though! I visited Japan for the first time last summer, and had okonomiyaki twice in Hiroshima. It was so delicious. I'm very glad to now have a recipe so that I can make it for myself here at home, and don't have to wait until the next time I visit Japan. I really enjoy a good okonomiyaki but don't find them too often around my area. I get to eat it only once every 3 or 4 months! Very close to the recipe I use at home. Dashi is hard hard hard for me to come by, so I've used homemade chicken stock instead, which works nicely. Also, someone I know suggested using rice krispies as a sub for the tempura bits. I like your idea of cooking some of the batter instead! Hi Maki-san - I'm REALLY hungry now...! I love this dish, but only knew how to make it using okonomiyaki mix. The mix usually makes the pancake really dense, too much for my liking so I'm excited to try this recipe. There's an okonomiyaki restaurant I go to all the time and they have some fun & interesting choices of ingredients in lieu of pork belly, such as: ground beef and miso, mochi and cheese, natto, spam and cheese, pork and kimchee...to name a few. I've tried them and they were surprisingly good. Another tip for others that are new to handling nagaimo, wear a new/clean rubber glove when peeling and grating them. They are super slippery so this allows a good grip and provides extra protection for your hand. I learned that the hard way. Saving the nagaimo in the freezer? I was wondering if you could grate the whole nagaimo and place the pre-measured goo into silicone cups and freeze it? I always end up with a huge chunk left after making okonomiyaki, and it seems like a waste to throw it out. sure, you can freeze the grated nagaimo. Spread it out thinly, and break off as much as you need to use! what to do with leftover nagaimo? 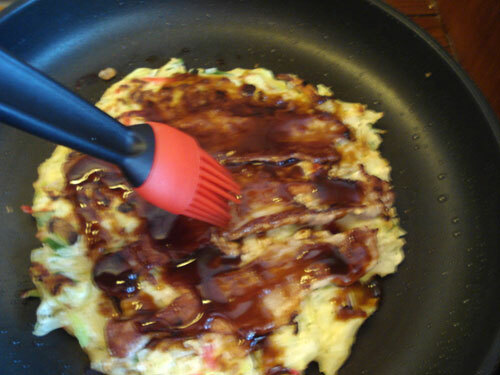 The last time I wanted to make okonomiyaki, I bought the okonomiyaki mix that contains powdered nagaimo. Since the mix is a little pricey, I'd rather buy the nagaimo separately. What else I can do with nagaimo, since they sell it in about one foot-long sections here in the States. I'm not the biggest fan of tororo. I forget where I read it, but instead of tenkasu, you can use crisped rice cereal for a similar crunch. Jin, you can freeze the leftover nagaimo (see above comments), or make ganmodoki (tofu fritters). Nagaimo is used as a binder in a lot of things. I substituted those fried onions you can buy in a can for the tenkasu as I didn't have any at the time and it was a nice surpirse! Still the oily flavor crunch and some added onion flavor which I love! Wow, it seems like a lot of work. No wonder my mom uses a mix. Even then, I love it. Nagaimo question....and kelp powder help please. Thanks! I would very much like to try this recipe and finally found a store here that sells the nagaimo. Having never cooked with this before, I still have some questions. When you actually grate this veggie, do you have to peel off the skin first, or is the skin grated with it as well? Does this keep in the fridge for long? PS: a bit off topic, but a friend recently found that her natural store carries bulk kelp powder. She asked me if instead of soaking kelp in water for 20 minutes to make dashi, if she could just use the kelp powder and then add katsuobushi flakes directly into it to make dashi (better than the store bought instant dashi granules she said). I have no idea, any ideas? And what would one use kelp powder for in cooking. Thanks a lot. Nagaimo should be peeled before grating. By 'it' do you mean the nagaimo? If so, nagaimo does keep for a pretty long time in the fridge - a month or more even, as long as the ends are dried off before wrapping (an oldstyle way of doing this was to dip the end in some sawdust. I just wipe it off well with a paper towel and let it air-dry). I don't know what kind of kelp your friend got...if she finds it very fragrant and flavorful I guess she could use it for dashi. Follow your nose and tongue and see where it leads! I must say, when I tried the Hiroshima style I couldn't eat Osaka style okonomiyaki anymore lol. Also..the whole 1000kcal thing...I don't think I could eat the whole thing okonomiyaki. I always have to half it because it's so filling. Though I didn't remember the cabbage being chopped so small...but it -has- been awhile... I'm going to give it ago! It looks tasty! Thanks for putting this page up! I have a couple of books with recipes for okonomiyaki which I've dutifully followed. Occasionally I brace myself to have another go (also with recipes from the internet). The results are invariably disgusting. FINALLY I've made a version to be proud of. Really tasty! Only difference is that I sprinkled on some vegetarian bacon flavoured bits (the flavour is a bit 'junky' but seems to go well with the okonomiyaki sauce). And your recipe is such a good base that even when I tried to make it the third time and had run out of nagaimo, substituting grated boiled potato (and a little extra dashi) worked out beautifully. It's even converted my non-okonomiyaki loving husband. I can't tell you how happy we are that you posted this recipe! I've tried a couple of other okonomiyaki recipes online and none of them turned out as well as this one! Thank you so much Maki! I really love your site! I was in Kobe for a month in summer 2002, and have occasionally craved the okonomiyaki I had there. The other recipes I saw omitted the nagaimo (one referred to it as "Chinese yam" which was fascinating when I was looking for it in the Vietnamese market ages ago) and appropriate seasonings, or used ingredients I was certain would not give the right texture. Thank you for posting your recipe! I am looking forward to making this next week (after I munch through the backlog of leftovers from a potluck this weekend). We eat this so regularly now that sourcing nagaimo has become an issue. It took us a long time to work out where to get nagaimo economically, I hope someone else can benefit. I would like to thank you for the recipe. I nnated to ask if one can substitute Backerbsen for the Tenkasu? They are both bits of deep fried batter. If you crush them up a bit they should work. That's a really good idea btw...I'll have to try it out sometime! It looks super scrumptous and fulfilling!oI have never tryed okonomiyaki but everytime i see some my stomach has a storm! Ooh, nice homemade batter recipe! The tenkasu is definitely more of a Hiroshima thing, I've noticed. Osakans seem to be pretty particular about how they like their okonomiyaki, and I rarely see them made with tenkasu around here. Though I have never used nagaimo in my okonomiyaki, I have had great luck blending all-purpose flour half and half with potato starch which provides some of the lightness that must come from the nagaimo. I love okonomiyaki and have made it for years. DH & I found the potato starch to be a great improvement on our original recipe. It keeps well, it's cheap and easy to find in any Asian grocer and many other shops. Hi! I never thought of searching for this recipe since i didn't even know its name but THANK YOU SO MUCH FOR POSTING IT HERE! IT LOOKS UTTERLY AMAZING! the only glitch? I'm trying to stick to a diet plan so...could i trouble you to tell me an approximation of the calories, etc. of this mouth-watering meal? i've gotta try this recipe sometime! Maki - どもうあせがとうございます!! Not sure the hiragana wil l show up in the post, so domo arigato gozaimasu! Each time I go to Tokyo I go to my favorite Okonomiyaki place where I indulge (adding butakimuchi to the experience), and then when I'm back in Seattle I lament at the total lack of Okonimaki offering. Thanks so much Maki! I have been looking for the batter recipe everywhere not only did you help with that I now know a fantastic new stock... looking forward to making this! When we were in Japan going to an Okonomiyaki restaurant was something I will never forget! so much fun. I've made Okonomiyaki before using recipies from off the actual okonomiyaki sauce bottle, but that one left out the nagaimo, and it was alright, but boy does the nagaimo make a huge difference in the taste and texture, its so much better with it IMO. Thanks for posting this! I made it with thinly sliced beef (rib meat) instead of the port for less fat content and it was still very tasty. Are there any good substitutes for those? Has anyone tried adding just salted crisps to this instead of the deep fried batter? Crisps being potato chips to the rest of the world, of course. Crisp rolls are a treat if you walk along the canal on a spring afternoon as well ;). 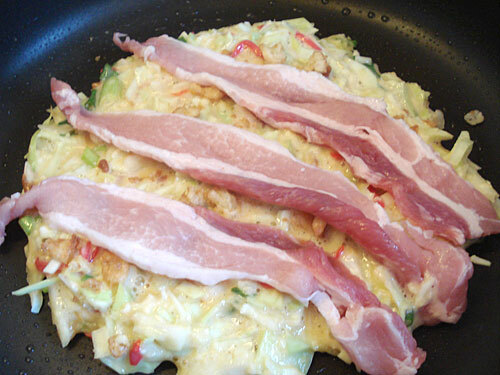 when I saw this recipie i could help but say this- in osaka, they put bacon due to the fact that the recipe is Okonomiyaki, there are four different kinds according to regional areas of japan. when makeing this , please show recpect and ad bacon. I have a hard time deciphering what you wrote, but bacon as it is known in the West does not exist in Japan. (In fact, the very word bacon is imported as ベーコン.) Every Osaka style okonomiyaki I have known uses 豚バラ肉の薄切り or similar. It also states clearly, in the title, that recipe also clearly states that it is one for Osaka style okonomiyaki, which is the most popular kind. It doesn't say "this is a complete history of every kind of okonomiyaki". When I post a recipe for Spaghetti Bolognese, I don't go into an entire history of meatbased pasta sauces either. 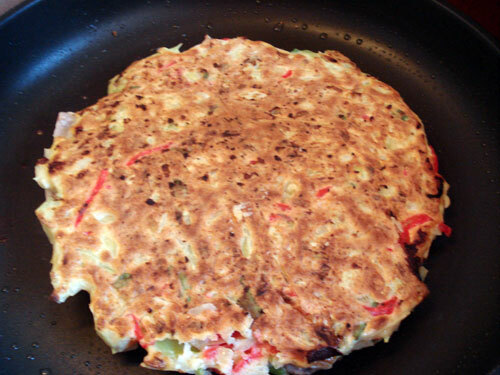 Perhaps at some other point I'll post recipes for Hiroshima style okonomiyaki or monjayaki etc. So, I really don't know what you mean by 'show respect'. I know of an OKONOMIYAKI restaurant in Singapore that serves delicious authentic Osaka Okonomiyaki just like what you displayed in this blog. Your explanation is very good and well detailed. Thank you for sharing..... If you are in SINGAPORE, go to Okonomiyaki House Iroha 168, Basement 1 of Orchard Hotel Shopping Arcade, Orchard Road. A nice little cosy restaurant that serves Okonomiyaki, ModanYaki and Teppanyaki. The Owner and Chef is Japanese and was trained in Osaka to do this. The best in Singapore, as I know Japanese and Singaporean keep going back as regular customers. Can't wait to try this one. After I started watching Ranma 1/2, I kept asking myself, "What is okonomiyaki, and why does it sound so delicious just watching it on an animated show?" Well, I had to answer the question and got okonomiyaki in the one place in Seattle that offers it. It was delicious. 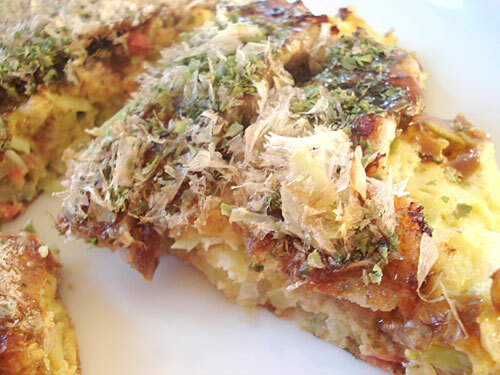 We were curious about making Takoyaki but along our research we come along with this Okonomiyaki. We found out that one food cart business in our place named Takuyaki is not a real Japanese Takoyaki since there is no squid in it and we wonder why they have cabbage fillings in it. The result: they are using an Okonomiyaki ingredients cooked in Takoyaki pan. Sounds like Okonomiyaki Balls...Ha-ha-ha! Its hard to make one when ingredients are not all available. We do have replacements like for the batter, instead of Dashi, we used flavor powders like shrimp. We did twice already and doing well. The one we read in this website is very inspiring. We know it adds up to our research until we can came up with a local version. Thank you. More Okonomiyaki to come. Tonight I made this for the first time - hubby and I loved it! (I've had it in restaurants, and this was just as good!) Thanks! we just returned from kyoto where we had okonomiyaki several times, both homemade (at neighborhood hanami) and at a wonderful, hole-in-the-wall okonomiyaki restaurant (3 tiny tables). yours is the first recipe i've found that does it right, and it answered many questions i had about the finer points. any ideas for a recipe to make a substitute for kewpie mayo without the msg? american mayo just isn't the same. i was thinking of adding a bit of rice vinegar, sugar and water. what do you think? I am not sure that you can add things to American mayonnaise. It seems that Kewpie gets its characteristic taste from the rice vinegar, a bit of sugar, and also double the amount of egg yolks 'regular' mayo has. Since say, Hellman's uses a different kind of vinegar and so on, I am not sure adding more vinegar would make a difference...and sugar would make it taste odd probably. You could try to make mayo from scratch, though I haven't yet figured out a Kewpie-like formula! Here is a translation I did from the Kewpie site about their formula and so on. Thanks for your clear and detailed explanation! I made these last night, and they were terrific!! You can see my version here. This is so yummy... I'm glad that I came across your very educational, interesting and wonderful site. I can now try to cook this recipe at home for my family and let them enjoy its taste and the good nutrition it can provide! More power and good luck!!! Can I substitute Yamaimo with Gobo? (Burdock) Because im from Singapore and its rather hard to find Yamaimo. I found the mix though and its really expensive! Gobo is not a good substitute for yamaimo in any way...totally different texture. You can try substituting grated potato or (maybe better) grated satoimo or taro root. Don't even need to bother with Yamaimo really. You can get Nagaimo from the Isetan supermarket, B1 at Isetan Scotts (it's at the vege section on the left as you enter the store) or from Meidi-ya at Liang Court. Both carry Nagaimo. Good luck with the Okonomiyaki! I am wimpy, having only made okonomiyaki with a mix - so it's quite a treat to see you do it so studly from scratch with so many photos. Thank you so much for sharing! I haven't tried to make this yet but I want to. The only problem that seems to present itself is the sauce. I know I can get it on Amazon, but I'd like to try to make it myself first. Do you know a good recipe that's not too hard to make? Try this;it's sweeter than tonkatsu sauce.It tastes fantastic drizzled over mayo on okonomiyaki.Try it on breaded,fried seafood or chicken tenders too. Mix well,allow flavors to blend.You can try more garlic/soy/worcestershire and ginger if you like it more pungent. I have a bottle of this okonomiyaki sauce that I was given as a gift from a dear friend who lives in Northern Japan. (She found out that I love Okonomiyaki and Takoyaki). My problem is that I am pretty intimidated by making either of these dishes (I can't make American pancakes! How can I make Japanese ones!!). So I have a bottle of sauce in my cupboard and I don't know what I can use it for! Any suggestions? She also gave me the Aonori and I think I can find uses for that but this sauce? What to do with this sauce? Hi Erin. You can use the okonomiyaki sauce just as you might use steak sauce, on hamburgers for instance (esp. Japanese style hamburgers). You can use it as a a sauce on korokke (Japanese croquettes) and menchikatsu - recipes on site. You can use it as a flavoring whem making stir fried noodles. Or even for stir fried vegetables. If it's too sweet for you you can try tempering it with ketchup, or siracha sauce, and so on. Do you think a Korean grocery store would have that stuff? There are no Japanese Import stores here. I live on the Atlantic coast of the US. Thank you for posting all this comfort food. I haven't eaten this kind of food since I was a kid growing up in SoCal. Our family enjoys any type of 'sit around the table & cook your own' type of meal. So we own a few fondue pots, but all that gets old after awhile. A few months back, I bought a raclette grill, and we've been enjoying that ever since. This summer I even built a kotatsu table, knowing from my 2 years in Japan over 25 years ago how very great it would work for our 'cook your own' meals - especially with our cold, cold winters here in the White Mountains of New Hampshire! Now, I have something else to try - because despite a raclette being intended for an entirely different type of food, I think the grill part of it would work just great for this. I may even be able to sneak cabbage in the kids bellies without them knowing - I'll tell them it's lettuce - yeah, that's the ticket! Upon browsing through your list of 100 Japanese foods to try, I came across this recipe and I became really excited. About 10 years ago, I visited Japan on vacation with my mom, dad, and brother and, while in Osaka, tried okonomiyaki and loved it, my dad especially. He's been searching for YEARS for the right okonomiyaki sauce, which was used at the restaurant where we ate, but to his dismay, nothing we can find here in the US comes close (even at the Japanese supermarket in our hometown!). I was wondering, do you know if okonomiyaki restaurants make their own sauce? If so, would you happen to have a recipe? If not, is there a particular brand of the sauce that you would recommend I use? Some okonomiyaki places do make their own sauce. It's impossible for me to tell though unless I try that particular store myself though! I got these little black fuzzy balls that they told me were nagaimo at the store, but they don't look like yours. Would they work? Hmm, did they look anything like these? If so they are satoimo, not nagaimo, and they are well, different. I would suggest substituting plain old white potato rather than satoimo for nagaimo. Edit: My mom mentions that there is a kind of yamaimo that is round and brown and hairy, so it could have been that. I know okonomiyaki is a Kansai dish, but if you're in Tokyo I strongly recommend Sometaro (in Askakusa near the Tawaramachi subway station). It's sit on the floor, cook your own, but they have instructions in English :-) and the waitresses are happy to help out. Great fun and a great variety of okonomiyaki and yakisoba choices. Now, finally I just tried a slight variation of your recipe, and it was a hit with both my husband and me. So thanks for your yummy, yummy recipe! 1) Since I didn’t have taro at home I substituted a finely grated plantain (cooking banana which has absolutely no banana taste when it’s green). That gives a light, slimy goop, too, when you grate it into salt water (or dashi). 2) As a gluten free substitute for 60g flour, I used 20g tapioca starch, 20g rice flour and 20g cornstarch. Worked a treat. 3) No pork, since there wasn’t any in the household - I’m currently having a not-much-meat phase... springtime in the southern hemisphere, you know. Since I’ve never been to Osaka, none of the Japanese restaurants around here have Okonomiyaki, I have no “original” to compare it with, but hey, I don’t think I need to. This will definitely be on our menu again! Cheers from Wellington, New Zealand. Plantains instead of yamaimo is an interesting idea. I'll have to try it sometime. I substituted tapioca powder instead of nagaimo - worked great but use 2 eggs instead of 3! Thanks for the recipe - what a great site. it's really interesting to note that the lowly nagaimo has lots to offer. i forgot how we call it in my dialect, my family simply called it 'root crop'. my mother would boil the 'root crop' until cooked and we would dip it in sugar. it was a joy eating it when shared with the whole family. a variation would be to cut it into cubes and cook in coconut milk and sugar with local crops like sweet potato, jackfruit, taro, cooking banana... delicioso!!! Out of all of the Okonomiyaki recipies I've been digging through, this one is the most helpful, articulated, and punctual. Thank you very much for helping! I'm so lucky to live in Victoria where we have a Chinatown and I can hopefully find the perfect ingredients! Hello Maki and thank you for the wonderful recipe and directions! Okonomiyaki is my favorite food. My stepmom Ritsuko is from Osaka and she makes it for me when I visit. I also had it several times when I visited Japan, twice in Osaka and once in Hiroshima. I couldn't believe I was able to pull it off here in Boise, Idaho but it was a huge success and my boyfriend loved it too! I did have to use Tonkatsu sauce instead of Okonomiyaki sauce, but the flavor was very close. Thanks soooo much! I just wanted to make a quick comment as I'm a HUGE taro root fan, that the Taro root is called Satoimo, and is from a completely different plant than Nagaimo. It even looks very different. I'm sure you can probably substitute it but just wanted to make that clear as to not confuse some people. I am very well aware that satoimo is the root most commonly called taro root (see here); however, my point was that I have seen nagaimo ALSO being sold labeled as taro root or 'yam'. That is why I included the picture. So delicious! The hardest thing to find was the nagaimo but worth it. It is expensive but you can freeze the leftover "yam puree". Use the circular Japanese grater for it (I found it at Daiso, a Japanese dollar store chain w/shops around the world) which makes the job easier. Substituted fried onion rings (like that for Green Bean casserole) for the tenkasu, sliced breaded chicken strips for shrimp since I didn't have any, and turkey bacon for pork belly. You really can put in anything you want. With all these additions, I didn't have as much batter but it still turned out wonderful. Better than the restaurants' versions and so much less expensive. I made this last night . It tasted just like the kind I get in japan.I was so happy,I danced . Id never have thought I could make it from scratch. I too prefer Osaka style.I like Hiroshima style,but the added egg and yakisoba seems to just add calories. I only eat it if I am actually IN Hiroshima. I am also used to my okonomiyaki with pork, shrimp ,and octopus or squid. The places I love in Tokyo,also let you cook your own on the grill at the table. They also do add the crispies .Not in Osaka though. They cook it on the grill for you,in front of you ,in Oska . And I've actually become allergic to shrimp in the last 3 years,so I put a bit more pork,and also I took a small round mochi,and cut it into 1/4th inch cubes. The place I go in osaka adds mochi at your request,and I love it,but I don't like it in one big hunk. The little bits of it through out were awesome ! I'm am definately gearing up to try my hand at takoyaki now. I have to buy the grill,but that's next. Try subsistuting 'prochutto' for pork or bacon. Delicious and comes thinly sliced, doesn't need cooking. Thanks for this recipe! My Japanese friends taught me how to make it once and they used bread crumbs instead fritters. 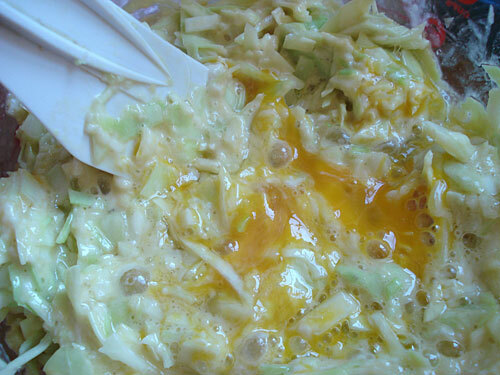 To make it healthier I also added more cabbage and use thin pork slices instead of bacon. Our local okonomiyaki restaurant also makes different varieties with seafood, which is another way to make it healthier. I have already bookmarked a few recipes to try! Will let you know how they go! Have just come back from Osaka where I fell in love with okonomiyaki.Beats a big mac by miles. This is now my favourite fast food, gimme, gimme, gimme. Thanks for the info on how to cook, will get adventurous and try. Wish me luck. Just happened to have these leftover items in the fridge and made something like okonomiyaki with it: prepared sesame noodles, baked chicken, celery, onion, garlic, eggs, and flour. Topped it with a hoisin sauce mixed with a Kobe garlic sauce. Loved it. Couldn't a done it without your help. Served with a side of green salad to lighten the load. Makes me want to go out drinking in Osaka! I was watching a movie the other day and it had okonomiyaki's in it. I thought they looked very tasty. i like to cook eat new things, so i found your recipe online it was very helpful. Thank you! Ps.Just as i suspected it was very tasty. My wife loved it, this will not be the last time we have it!! Over two years after you posted this... I made this tonight, and it was excellent! I just wanted to say thank you so much for posting this recipe with clear instructions and photos. I had okonomiyaki when I was in Japan but I'd never made it at home, so it was nice to feel like someone was holding my hand as I cooked. Thanks! These are delicious - however it is so far from the simple art of traditional Japanese cooking that it is actually a little sad, for the culture and the waistline of the people. I reckon this must have been invented to keep fat Americans happy? Absolutely not, it was invented by Japanese people for themselves. Japanese cuisine is far more complex and varied than you are probably thinking. When I was in a homestay in Japan I had a host mother who cooked the most fantastic array of food, both traditional and modern, so I feel I have a good sense of the type of traditional cooking that is still within the grasp of a working mom. For starters, a lot of dishes have a lot of oil (tempura and other deep fried foods are well-loved) or a lot of fat (because they don't trim it when they prepare the meat). Soba and udon can be quite healthy and are on the simpler side, but can be accompanied by tempura or onigiri. Ancient meals involved several bowls of rice so the other dishes were all called side-dishes, but nowadays a meal consists mostly of the side dishes and comes with rice. In short, it is hard to stereotype Japanese cooking because it really does have all the variety of the cuisines present in the U.S. (including regional and international cooking styles). If I had to choose something that was invented to keep Americans happy, it would be the California roll. Due to the differences in availability of vegetables and fish in different parts of the world we make adjustments, and the California roll made sense for the ingredients available in California. Even so it is not so different in nutrition or taste than Japanese sushi. Hey, just wondering. When I make my okonomiyaki, it turns out kinda soft-ish but I prefer mine bouncier and chewier. Do I just make more of the batter. Or should I add more flour, put more nagaimo, etc? thanks! I can't find Okonomiyaki anywhere in Denver. This tastes just like what I had in Japan. Thank you. Hajimemashite! I put Okonomi yaki Osaka style recipe to my blog also. I am grad you describe the ingredients. I put picutres for mine. Okonomi yaki is getting popular in U.S.
but unfortunately in my town in the high class Japanese restaurant, it is not really close to real one. So I try to let people know the real taste. One restaurant in downtown have Okonomi yaki and it was very small (maybe less than 10cm diameter) and it was $16!! I woule like to say, "people!! you can make this in your house and much better taste!!!!!" 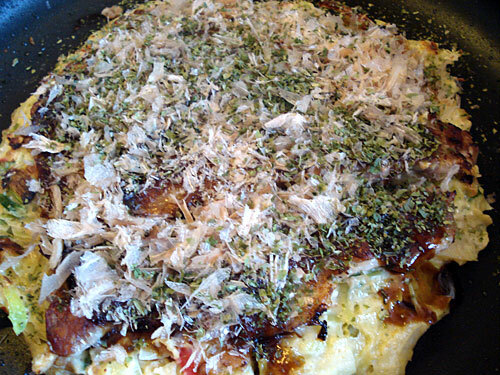 I use Okonomi yaki no Kona (Okonomiyaki flour) and you used Nagaimo and flour. Also I use Tenpura ko (Tempra flour). It is hard to find if you don't have asian store in your town. Especially Yamaimo. I can't thank you enough for such a wonderful recipe! I made this today and it was so much better than those mixed okonomiyaki flour and the one I used to order at a Japanese food court here in Chicago. Thank you so much. This is definitely a keeper! Happy New Year! I never had Japanese pizza before, Ahhh it look so good. Most of Japanese food that I like are Ramen and Sushi. Hopefully I will get to eat real Japanese pizza soon. If we have too much batter, can we make the okonomiyaki, let it cool, and then wrap it with plastic wrap to store in the freezer? If it can be frozen without compromising taste and texture much, about how long would it last? What is the best way to store leftover sakura ebi, aonori, and katsuobushi? Thanks! I lived in Iwakuni, Japan for 18 months. While there we found this little hole in the wall restaurant with a moma-san who brought us over some Okonomiyaki to try. It was excellent and for 34+ years I have been looking for the recipe. I can't wait to try it with the Japanese pan noodles as described in the Hiroshima version since Iwakuni was 30k south. Most restaurants here in the states do not have this; many of the waitresses said that it was an old dish that their grandmothers made but no one knew the recipe. Domo to the person that added this. Okonomiyaki is one of our family favourites... about the only way my kids will eat cabbage, which we grow and end up with copious amounts of! 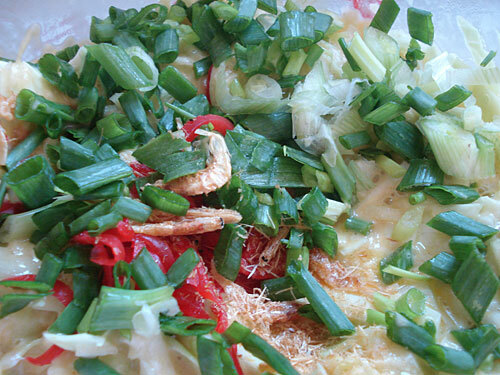 - "okonomi" means "whatever you like", so use the basic batter and cabbage and add the things YOU like. We often use bacon, left-over cold meats, corn, or whatever's in the fridge! - haven't used the nagaimo... will give it a try if I can find some. We just use flour, egg & a little water. - we've experimented with cabbage... we like the chinese cabbage (more water content and less strong flavour) and have also used purple cabbage from our garden. Thanks for the recipe - I'm looking forward to experimenting! Also, one tip for people who can't find okonomiyaki sauce or just can't afford the calories, okonomiyaki is delicious if you eat it dipped in dashi or shoyu-dashi. Whenever I eat it this way I omit the toppings (sauce, mayonaise, katsuobushi and nori). I think this might be Akashi style. Thanks for all of your recipes! This is the best Japanese food blog I've found! I just had this in the Sunrise Mart in NYC. 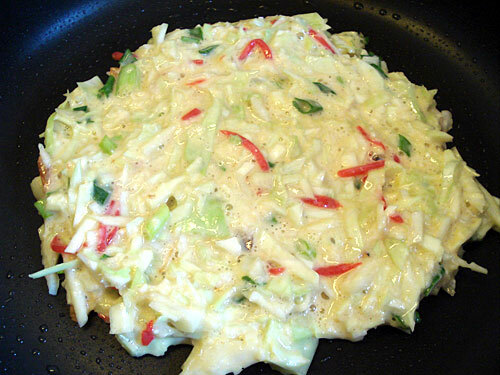 This is a Japanese Frittata! I love it. I discovered okonomiyaki - or rather it discovered me - while buying clothes in Camden Lock market,London, UK. There's a bustling food stall area full of enthusiastic cooks thrusting samples at you as you meander through the maze. A young Japanese guy, who was running his stall solo, handed me a chunk of something, he said it was traditional Japanese street food. It was delicious so I ordered one, he cooked, we chatted. I had no idea what this thing was called but a quick search of the interweb led me here. I'm now a fan and I have since bought your book from one of my favourite London stores - The Japan Centre. I have made this three times now and even with grating the nagaimo and making on-the-go tenkasu this is remarkably quick and easy to prepare and in fact quite relaxing. It also seems to be nearly fool-proof, it's worked perfectly each time and I no longer refer to the recipe, just do it by eyeballing how it looks, thank you Maki! I made these for the first time last night, and they were fantastic! My wife is vegetarian, so we substituted sliced baby portabella mushrooms for the pork belly. I can't wait to make these again. I really enjoy reading both of your blogs. I have not made a bad-tasting Japanese dish yet, thanks to you! i read that this is top 10 must eat in singapore, can you tell me where to eat Okonomikyaki in singapore? I have never been to Singapore I wouldn't know. It's interesting if it is indeed a must eat in Singapore since it's not a Singaporean dish at all. I would say that it is a must eat in Osaka or Hiroshima. OMG! I LOVED this while we lived in Japan. I always got it when we were out at festivals. I am going to have to try to find these ingredients to make it myself now! This is the most authentic looking one I have seen yet! How do you grate the potatoes or the nagaimo? Do you need a really fine grater? It will just come out as liquid with a grater? Me and my boyfriend tried Okonomiyaki this spring when we went to Japan (Tokyo) for the first time, and we i loved the dish. I've been wanting to try this recipe for a while now but never got around to it. Now finally we have, and it sure felt like we were back in Japan. Unfortunately we had no bonito (I've tried the kind available at our local Asian grocery store, but it had gone bad), but it tasted delicious anyway. We will definitely make Okonomiyaki again, soon! Thanks for sharing the recipe. I love your blog! Love from Sweden! Maki, is it possible to substitute something like arrowroot powder for the nagaimo? I can't get nagaimo anywhere near where I live, but I think arrowroot is available. Or would it be easier to just increase the water? Just made this for lunch, using your recipe with some needed substitutions. YUM! A suggestion for the goo-factor if nagaimo is not available, is a bit of guar or xanthan gums along with the blended or grated potato. About 1/4 teaspoon would do it. 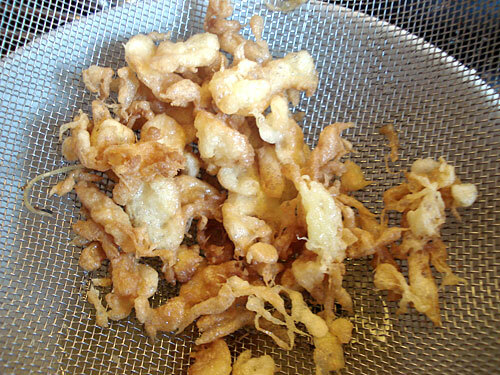 And as maybe someone already wrote, instead of the fried bits, fried onion crispies work well. I found that 2 oz. flour is a little over 1/2 cup. Thank you so much for the authentic recipe! Hi there, I just made okonomiyaki for the first time, folliwing your recipe. It was great! Thanks so much for the detailed recipe! Since I wasn't able to get nagaimo, I used egg-substitute (normally used for vegan cooking, I've got mine in a health-food-store) - it worked like a dream. As for tenkasu, I used "Backerbsen", which are readily available in Switzerland (Germany and Austria too, I think). Those are little round morsels of deep fried simple dough, normally used to put in soup. hi is it possible to replace the yamaimo w/ kudzu dessicated ? Thank you for your recipe. Had in mind to try to remake versions eaten in Japan(Tokyo, Nara, Kyoto and Onomichi, that must have been Hiroshima-style), but lacking "longpotato" I hesitated working with ordinary potato. Found your site and the recipe with potato worked great. I adjusted the amount of different vedgetables to the amount of batter given, and it tasted wonderfull. For the sauce I used chinese oystersauce, wourchester and ketchup in about equal quantities. It tasted so good we needed no toppings like furikake.. But dancing katsuobushi I cannot resist..